We celebrated six years of marriage at the beginning of this month, which meant some fun reflections on what it meant back when that guy and girl below exchanged vows. Sure, we read our books, we did our pre-martial counseling, but we had no idea exactly what we were diving into. And we didn't really care, as along as we were doing it together. Six beautiful, hard, sweet, growing years later, I am so thankful for this day and for that guy who asked me to be his wife. I'm so thankful for the gospel. For its power. For its life-rearranging wisdom. For its beauty. I can't imagine our marriage without this. It makes our dark moments hopeful. And our hard times more beautiful. It pulls us out of the nitty-gritty and shows us there is something more going on than having/being a perfect spouse. It helps us to embrace our weaknesses and moves our eyes from each other to the picture we are eager to paint—Jesus and his church. I'm thankful for our gospel community. Our community who loves the gospel and us. Who invests and imparts wisdom and points us Jesus. It's a very precious gift to our marriage. I have loved every single second of being a parent with Jon. I wouldn't have wanted to wait a month longer to start our growing family. Elizabeth, Hannah, Micah, and baby #4 have grown us and extended us in unbelievable ways. The things we have learned together on this parenting journey have been amazing, hard, and so joyfully wonderful. This year, more than the others, I have realized how much Jon is exactly what I have needed. Six years ago, I would have said he is all I have ever wanted. Idealism has been removed and reality has set in. No longer are there ideals of who my husband is or who I am as a wife. We see each other exactly as we are. Weaknesses, blemishes, and personality differences. I don't want my ideal Jon. I'm thankful for his weaknesses and his quirkiness that make him so real. And that's what I need: a real husband, not a facade of one. 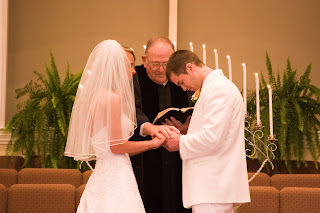 Of all the things I've reflected on over the past six years, knowing all I know now, I would have just as eagerly said yes to him on that October night; days after the Cardinals won the 2006 World Series and the night I flunked my Baptist History exam. Six years later, I love you more deeply than I could have ever imagined. And I'm so incredibly thankful for the truth of Ephesians 3. Though I don't deserve a husband like you, grace was given and Christ's unsearchable riches have been put on display. I feel like I can almost say with Paul that even through our marriage I've gained insight into the mysteries of Christ. You have been such a tangible expression of Christ's love for me. And, I know in full confidence, sixty years later I'll say I love you more deeply than I do today, because Jesus is able and willing to do exceedingly more than I could think or ask, including in our hearts and in our marriage. May his grace taste sweeter to us in our years to come. Even sweeter than these past six!